In 1994 five European countries met in Stuttgart (Germany) and changed the history of cheerleading. The meeting focused on extending cheerleading like other sports across the borders of Europe. Thus the European Cheerleader Association© (ECA) was founded. The basic rules & regulations for the association as well as future European Cheerleading Championships (ECC) were proposed. An unofficial ‘European Cheerleading Competition’ organized by ‘Orange Fire’ – cheerleader of the Stuttgart Bats took place later that day. The first official ECC was held, also in Stuttgart, in July 1995. In fact, the first three ECC’s were organized by Mrs Carmen Grunikiewiz and ‘Orange Fire’ – if it weren not for them, the European Cheerleader Association would not exist today. The ECA’s first president was Ms. Pernilla Eklund (Sweden). The ECA meets once a year during a weekend in February to discuss important issues and topics. Rules used to change once a year, but since 1999 they are adjusted every four years. 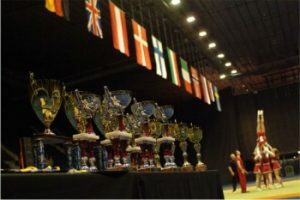 The history off ECC and JECC is archived at Competitions/Results.